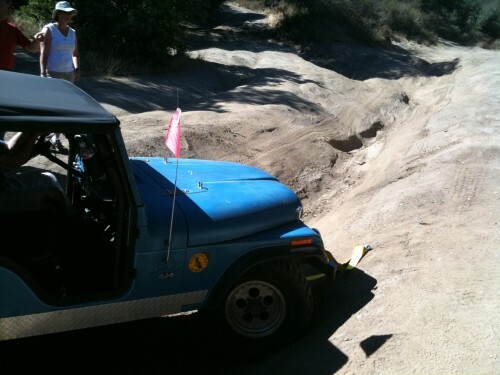 We finally got the newly modified Jeeps out for a little workout by taking them down to the Hollister offroad recreation area as part of a 4wheel clinic put on by one of the local Jeep clubs (Esprit de Four). I pulled Paul along with me as a 2nd driver and Lisa drove her Jeep alone (the passenger seat is out of her Jeep since her passenger is typically one of the dogs and the seat is replaced with a dog pillow or two. They had a mix of Jeeps, pickups and other SUVs. We were actually surprised by how well this older couple did with their late model Jeep Liberty (which isn’t what you’d normally consider as a serious offroad vehicle given that its more like a lightweight SUV but it does have a better suspension than other SUVs). They ran everyone thru some basics in a classroom session and recovery demo – the winching/recovery part was the only part that had info that I wasn’t really up on, since I’ve never owned a winch before. Then they split us up into 4 groups and we started on the trails and obstacles. Mostly basic stuff, nothing too interesting until we got to the washout ravine and the real obstacle course. Lisa has little trouble with all the obstacles given her 5″+ lift and big 35″ tires. Clearly, we’ll have to take it thru the larger boulder course to have more challenges. I was pretty psyched that Lisa let me drive her Jeep on the washed out ravine obstacle, but after popping a wheely, I guess she decided that was enough and took the keys back. All was well until late in the day when we did the stair step climb and I kinda goosed the throttle too much and the rear driveshaft snapped. Bummer. Good thing I had tools to remove it so I could drive it home in front-wheel drive mode. Lisa was totally smooth going up the stairs and barely even squeaked the tires. Oh well. Now I have a spare driveshaft in case I do it again. This entry was posted in Random crap by Art. Bookmark the permalink.